Thoughts about playing board games, new and old. 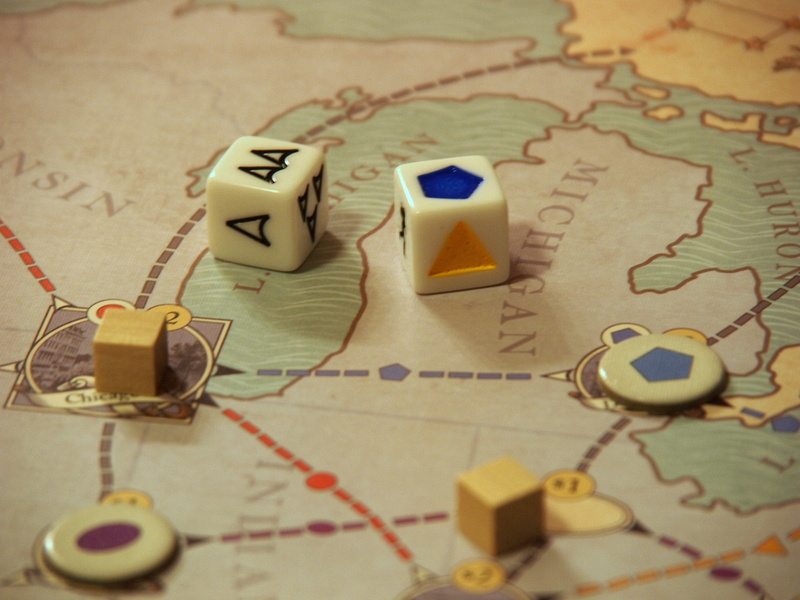 There's no question that board games are enjoying a welcome renaissance these days. The variety of choices we have when deciding what to play and buy is astonishing, even compared to five short years ago. More and more, in game reviews, I hear that the game under the reviewers lens is worth buying because it "fills a niche" (or doesn't, depending). This means there are lots of niches developing in people's collections. Where before there was just "co-operative game," we now add "co-op with traitor" and "co-op in 30 minutes" and so on and so forth. Today's potential niche-filler? A co-operative game about helping runaway slaves. 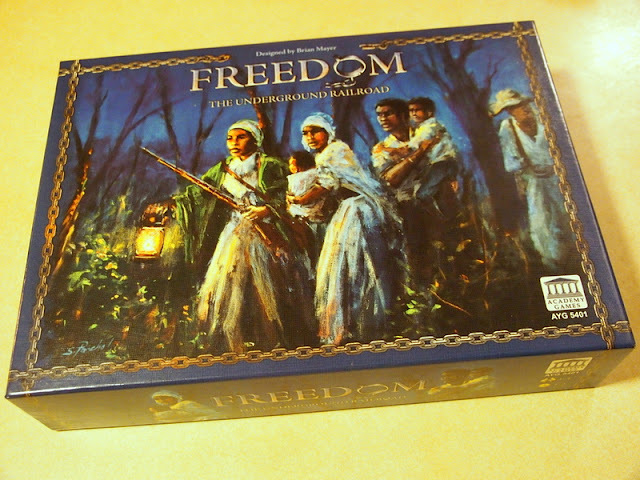 Freedom - The Underground Railroad is not the first board game to deal with slavery, but I've never seen one put the issue quite so front and center. You know those 'workers' in many games about ancient Egypt or colonial times? Yeah, they kind of represent slaves. But in Freedom, you have actual slave pawns who are trying to escape plantations in the southern US and make their way to the free land of Canada. It's not a subtle game. It is a very good one, though, if you like co-operative puzzle games with a little bit of randomness. Without focusing too much on the rules, the general gist is that you have slaves that move from market to the plantations (all automatically through game mechanics, so the players never actively buy slaves) and then start to move north on the map. Once on the move, they are totally under the players' control, but so are the slave catchers who march through the middle of the country, mostly. In fact, it is the "AI" of the slave catchers that I found to be a most brilliant challenge for the players. Aside from a die roll at the start of each turn that usually sends one slave catcher a space or three in a random direction, the players indirectly control the slave catchers. We do this by moving slaves. Whenever a slave ends his movement on a slave catcher's route (clearly marked on the game board), that catcher moves one space towards that slave. Since we can move slaves in whatever order we like on our turn, the meat of the map part of the game is to maneuver them in such a way that they all sneak by the evil discs representing the bounty hunters. Regular co-op players might have already realized that this kind of control of a relatively random-free puzzle means there exists the chance for an "alpha player" to simply dictate to other players what they should do, as there is likely to be a best course of action. There will often be many near-best routes, though, too, and sometimes there are just too many for the average gamer to figure out which path is best. Discussion is encouraged – vital, even, if the players want to win – but the rules do say that if there is ever a disagreement over an issue, the lead player gets to decide what happens. Moving the slaves around the board is only one part of the game. The other is gathering tokens and cards on the west side of the game board. While it's easy to buy conductor and fundraising tokens from the plentiful stacks at the beginning of the game's three periods (1800-1839, 1840-1859 and 1860-1865), the piles quickly dwindle and I think one of the ways good players will show themselves is knowing when to – and being able to – shift to gathering funds to buy the support tokens. These are expensive tokens that don't do anything except move you to the next period. The game features many ways to lose, but to win you not only need to get a target number of slaves to freedom but also to buy the requisite number of support tokens to prove you've won the hearts and minds of the citizens. I've played Freedom - The Underground Railroad four times (once solo, once with two players, twice with four) and never won. This is by design. Once of my four-player games was with a pre-publication prototype version, and the person in the game group who was communicating with the company producing the game, Academy Games, said that designer Brian Mayer wanted it to be a difficult game. The goal was for good players who knew what they were doing to win just 40 percent of their games. I'm guessing this is on the hardest mode, since there are rules suggestions for ways to make the game easier, and there are also "challenging" side of the slaves lost cards which increase the number of slave cubes (which are, ironically, beige colored) that you need to rescue. There is also a scoring system to track your progress each game. Overall, the components are high-quality, even though the publisher told me he's not 100 percent happy. Standards are high with Academy games, a company that knows something about turning history into board games, having made a number of war games about World Wars I and II, the Civil War and the American Revolution. Freedom - The Underground Railroad belongs to the company's "Birth of America Series" along with 1812 - The Invasion of Canada and 1775 - Rebellion. If you're playing the game over and over, the good news is that the game will feel somewhat different each time. Each player is given a specific role to play, and there are six characters available but a maximum of four players. It is also incredibly unlikely that you'll get all the way through any of the three period decks, so the cards you see each game will be different. There is also plenty of replay value even without the Kickstarter mini-deck, so if you missed out on that, there's no reason to skip this game (none of my four games used those cards). In fact, the only negatives that really jump out were the somewhat long playing time (90 minutes was average, but thankfully it didn't feel that long) and the somewhat time-consuming set-up phase. You need to filter and set-up three decks of cards, find the right slave market cards for the number of players, place the slave and slave catcher tokens and consult the rule book to see how many of the round tokens are used (again, based on the number of players). It's not overwhelming, but it will take a little while before you're ready to play. If Academy Games isn't working on an iPad version of this game, they're missing a big opportunity. With no hidden information and great team play, Freedom - The Underground Railroad would work incredibly well on a tablet, and my two minor criticisms would disappear. Speaking of the period cards, most are helpful and you'll want to buy them as soon as possible (but they get cheaper if you wait, so there's tension there). Each card (Reserve, General or Opposition) has a little bit of flavor text that tells you a little something about whatever or whoever is depicted on the face, and the selections are mostly appropriate for their in-game effect. The Frederick Douglass card, for example, is incredibly strong, giving each player $4. The red "opposition" cards are the ones that will set you back in some fashion. What's kind of interesting from a historical perspective is that some of the bad cards actually depict "good" events. The Compromise of 1850, for example, was a complicated deal, but one effect was that it allowed the North to build up its infrastructure in the decade or so by which it delayed the Civil War, and thus gave the Yankees a better military with which to fight the South. So, in reality, the Compromise helped end slavery (along with many other effects, like implementing a harsher Fugitive Slave Act). In the game, it is an Opposition Card that reduces fundraising totals in the North. 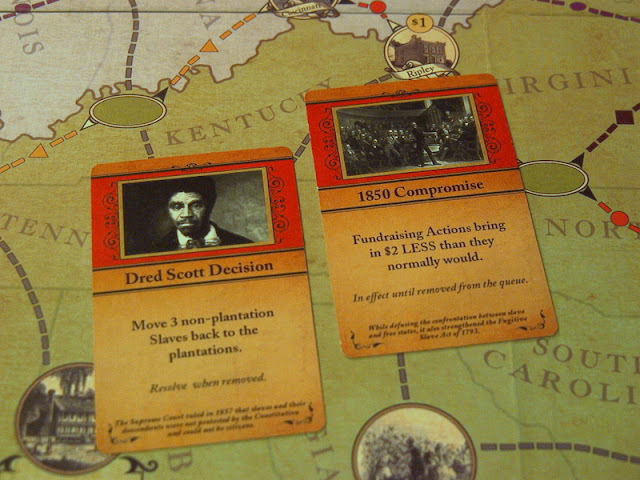 So, while the game does an overall excellent job of teaching while you play – the last two pages of the rule book are a short history of slavery in the US written by Matt Shoemaker from the Historical Society of Pennsylvania – it should be considered more of an introduction or supplement than the whole story. But we can't expect a board game to do everything, right? I'm happy with what I have here: a great cooperative game that happens to be about slavery. If every "educational game" were this good, that descriptor would not have the negative connotation it sometimes does. Part history less, part puzzle, Freedom - The Underground Railroad is inescapably about slavery. Sometimes, it turns out, this is not really a good thing. The idea of guiding slaves to freedom adds the appropriate amount of tension to the game, but one game group I played with sometimes made suboptimal moves (in purely game terms) because we didn't want to "lose" a slave (they don't die in the game, they just get sent them back to market). We didn't want to lose one because that felt like we were not just moving a wooden chit, but somehow letting an actual person get sent back to a horrible life. If you're at all squeamish about the topic, make sure to remind yourself that this is just a game. Luckily, there are times when you can use your feelings to your advantage. In one game, when it became clear we would not meet all of the win conditions, the group focused on getting the required number of slaves to Canada. We may not win this round, we figured, but at least we'll go down getting people to safety instead of collecting money for an at-that-time useless support token. This is a feeling I've never had in a game before, and it's just one more way that Freedom - The Underground Railroad without a doubt fills a special niche. This article originally appeared in Counter Magazine.